Today, I want to introduce you to Heather, a super sweet momma-to-be who blogs over at Finding Beauty in the Ordinary. She was kind enough to do a short Q&A with me about gearing up for motherhood and, as someone who has been praying with my husband about moving in the direction of starting a family, I am SO excited to share her thoughts! Take a look at Heather's Q&A below, and then stop over at Finding Beauty in the Ordinary to say hi! 1. Tell me a little bit about yourself and what's at the heart of your lovely blog. Hi! 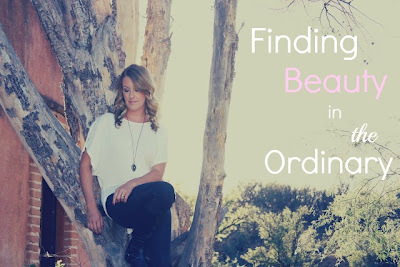 My name is Heather and I blog over at Finding Beauty in the Ordinary. The real heart behind my blog is to find beauty in all of life's moments-- the ordinary and the extraordinary ones-- and document them. I love to share what's on my heart and what God is teaching me. I love to share some recipes, document glimpses of our new life in Arizona, also share the adventures of being new homeowners, and most excitingly, soon-to-be new parents! 2. What have you found to be beautiful through your pregnancy? Has anything surprised you about being pregnant? Oh man! Everything! Pregnancy is an absolutely beautiful experience. Even all that morning sickness, goodness, I would do it all over again. I love feeling her move and kick inside me. I love how she reacts to cold drinks and loud music. I love planning her nursery, daydreaming about what she'll look like, all of it. I think the biggest thing that has surprised me about pregnancy is the horrible heartburn I've had-- why did no one warn me?! I know I sound redundant, but everything excites me. Even the sleepless nights and dirty diapers. I'm so excited to take her camping, on evening walks, and trips back home to San Diego. I'm looking forward to all those milestones, but especially watching her become a daddy's girl, because we all know she'll be wrapped around Joshua's finger :). Regarding both pregnancy and parenting-- it would be to just enjoy the moment and be present. Thanks again for stopping by, Heather. I'll be praying for you and your growing family in the months to come! God bless you guys. If you want to learn more about Heather, please visit her blog! Or you can say hello on Twitter or Facebook. I really like this concept that you utilize of interviewing other bloggers! Thanks! I've noticed it's a pretty popular concept with the blogs I follow. That's actually how I've found many of the blogs I love so much (because they were featured elsewhere). It helps with growth for both parties, just like sponsorship does :). Plus, I get to meet some amazing people and learn more about their lives, so it's a win-win all around!